Choose from a selection of 100 holiday rentals in Province of Syracuse. Use the search form to the left to filter the results and pick your choice of self catering accommodation in Province of Syracuse. We have a good selection of holiday apartments in Province of Syracuse perfect for family, single, romantic and group holidays. You may prefer to take a look at our listed holiday villas in Province of Syracuse or holiday apartments in Province of Syracuse. Find your holiday homes by a specific type using the property type drop down in the filter. Filter the holiday homes in Province of Syracuse by a specific area using the area list above. This pretty, wooden cottage is near the famous baroque town of Noto (11km). This home has a huge garden with a veranda that is well suited to enjoy wonderful holiday moments. 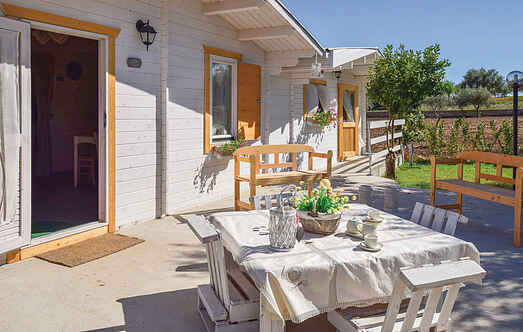 New, child friendly, comfortable villa "Sally", built in 2010, surrounded by trees, meadows and fields. House Equipment: air conditioning, washing machine (private use), tumble dryer (private use).